Multiple myeloma is a cancer that commences in plasma cells which are a part of the white blood cells present in the blood circulation. These plasma cells play an important part in the immune system of the body by producing antibodies to help protect the body against infection and damage. In this disease, plasma cells become abnormal and are then termed as myeloma cells, which produce antibodies known as M proteins. These myeloma cells gradually crowd out the normal cells within the bones and produce symptoms in several bones at a time, because of which this condition is termed as multiple myeloma. When myeloma cells collect in one single bone, this mass is known as plasmacytoma. Multiple myeloma produces symptoms such as weakness, tiredness, frequent infections, frequent thirst, bone pains - especially the back, broken bones, frequent urination, nausea, constipation, anaemia, weight loss, kidney failure, and amyloidosis. 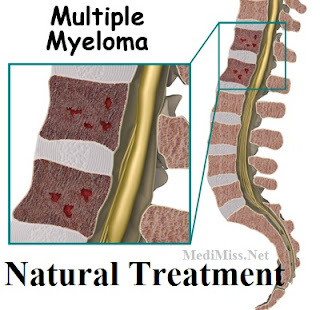 Multiple myeloma is diagnosed with the help of tests such as x-rays for bones, high levels of plasma cells and calcium in the blood, M protein and Beta 2 microglobulin, and Bence Jones protein test for 24 hours urine. A bone marrow examination is usually diagnostic of this condition. CT scan, MRI, and PET scan can be utilised to identify the spread of the disease and severity, after which the disease is graded so as to define the treatment plan for this condition. Anticancer drugs, radiation therapy, and stem cell transplantation constitute the conventional treatment for this condition. Overall, response to anticancer drugs and radiation therapy is quite poor, and most patients stop responding after some time. Ayurvedic herbal treatment is especially useful in the treatment of multiple myeloma, since it treats both the original problem in the bone marrow and also treats its associated symptoms. The herbal medicines which are used in the management of this condition have a specific action on the bone marrow and stimulate it to start producing normal plasma and other blood cells. Simultaneously, other medicines are utilised in order to kill and remove the abnormal plasma cells from the blood and the bones. These dead cells are then flushed out from the body either from the gastrointestinal tract or through the kidneys via the urine. Herbo- mineral medicines can be used in the management of multiple myeloma which normalise the production of red blood cells and white blood cells and thereby treat symptoms such as weakness, tiredness, frequent thirst and anaemia. Removal of the abnormal plasma cells from the bones reduces bone pains and prevents or reduces fracture of bones due to bone weakness. The excess calcium present in the blood is redirected towards the bones to normalise the disturbed metabolism resulting from multiple myeloma. Medicines which remove the debris, dead cancer cells, and generated toxins through the kidneys also have a preserving function on the kidneys so that these are not damaged due to the disease. If the affected individual exhibits symptoms of amyloidosis, this condition needs to be treated separately with Ayurvedic medicines. Some Ayurvedic medicines which are useful in the management of multiple myeloma include Guduchi (Tinospora cordifolia), Amalaki (Emblica officinalis),Gokshur (Tribulus terrestris), Abhadi Guggulu, Panch-Tikta-Ghrut Gugglu,Gokshuradi Guggulu and Mahamanjishthadi Qadha. Most individuals affected with multiple myeloma require Ayurvedic treatment for about 9 to 15 months in order to benefit significantly from treatment and obtain considerable relief from this condition. Ayurvedic treatment can definitely bring about a good response in this condition, which has so far proved to be refractory to conventional treatment, and herbal treatment can provide significant improvement in the quality of life as well as survival of affected individuals. Ayurvedic herbal treatment thus has a significant contribution to play in the management and treatment of multiple myeloma.